There is a giveaway that will be available throughout all blog tour stops. § A backlist ebook from ALL of the authors participating in the anthology (one each from Tamara Allen, Joanna Chambers, KJ Charles, Kaje Harper, Jordan L. Hawk, Aleksandr Voinov, and Alex Beecroft)…7 books in total! Welcome to another place in time...where one can be swept away into lands and eras long forgotten. Many men lost brothers overseas in the summer of 1944. Warren Burch was one of them. For months he still clung to his big city life in Philadelphia, but finally he's made the difficult choice to return to his home town. Warren's polio-stricken leg won't let him serve, so the least he can do is be there for his mother, when brother Charlie never again will. Arriving home means a whole new life, constrained by the rhythms and prejudices of a small town. Fortunately, it's made more interesting by the mysterious and attractive young man next door. 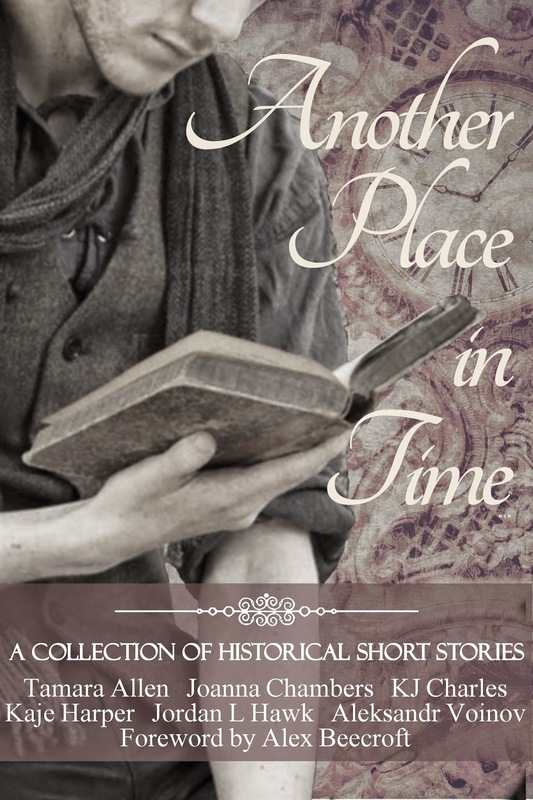 Along with a foreword written by Alex Beecroft, enjoy these original short stories that make up "Another Place in Time".